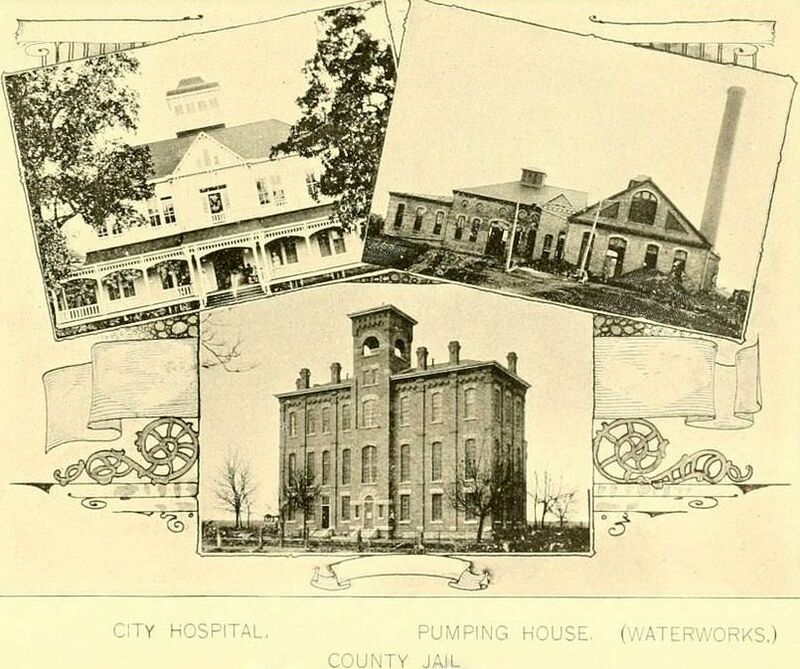 From 1894, an odd grouping of buildings: the City Hospital, a Dallas Waterworks Pumping House, and the Dallas County Jail. From a distance of 120 years, they’re all rather pleasant-looking, a word that would never be used to describe their 21st-century institutional counterparts. I wondered how many of the buildings had made it to the 20th century. Happily, they all did. City Hospital opened in May of 1894 at Maple and Oak Lawn (it later became known as Parkland Hospital, the name coming from the 17 acres of land it occupied that had originally been planned as a city park). 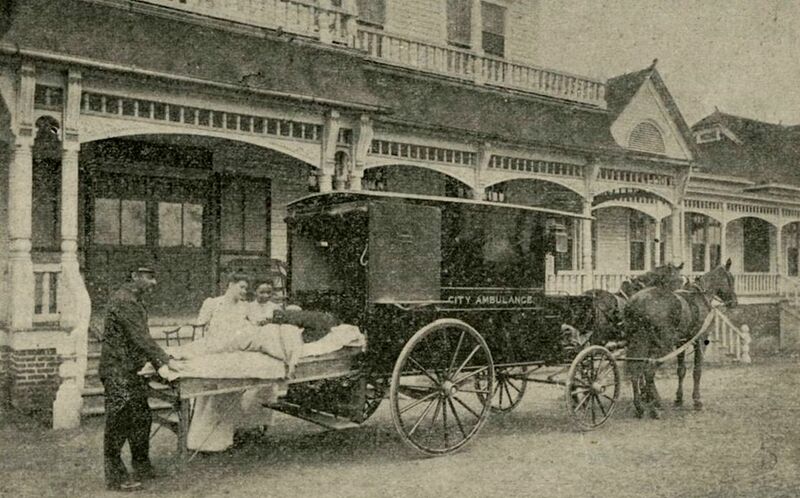 Here it is in about 1903, as a patient arrives in a horse-drawn ambulance. This wooden building was replaced in 1913 by the brick building that — yay! — still stands (in amongst its recent expansion and expansion and expansion by real estate mogul Crow the younger). I looked all over for a later photograph of the “pumping station” but was unable to find a definite photo. I knew that it was built after the original pump house at Browder’s/Browder Springs in City Park and before the one now housing the Sammons Center for the Arts and the one at White Rock Lake. I think it might be this one, the Turtle Creek station, shown above during the devastating 1908 flood. If this is the same pump station, it looks as if there was quite a bit of expansion to this structure, too. 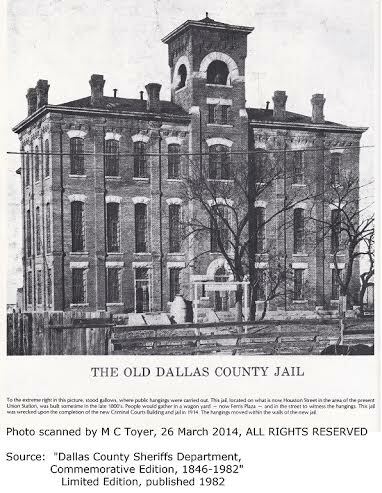 The building that changed the most from the pristine structure in the original 1894 photo was the Dallas County Jail, which was located at Houston and Jackson streets. Built in 1881, it was 13 years old in the original photograph. By the time it was 33 years old, it was almost unrecognizable, as can be seen (…sort of) in this photo, even with the horrible resolution. The jail had to keep expanding to keep up with demand and became a hulking mess. In the first decade of the century, reports began to appear in the newspapers of the deplorable conditions of the old jail and demands were made to improve conditions for prisoners. 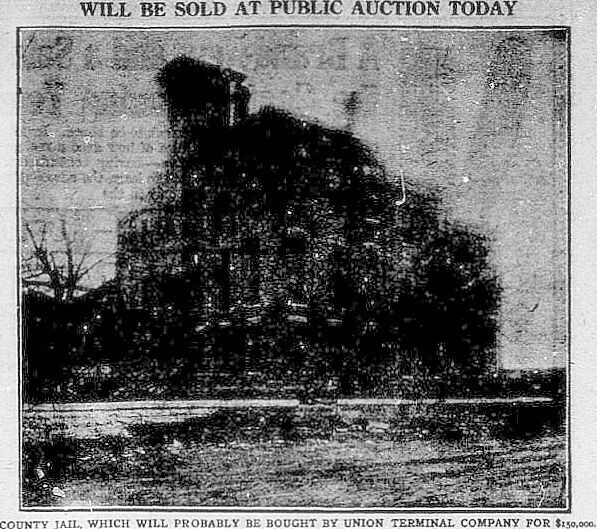 A new jail was built and the old one was auctioned off to the the Union Terminal Company which demolished the building in 1916, as the finishing touches were put on its Union Station, mere steps away from the former jail. UPDATE: Thanks to reader M.C. Toyer, I have a couple of really great photos of the Old County Jail! I’m not sure of the date of the one above, but the one below (such a great photo!) is dated 1915, the year the Old County Jail was finally emptied of its inmates, and a year before it was demolished. Thanks for the great photos, MC! 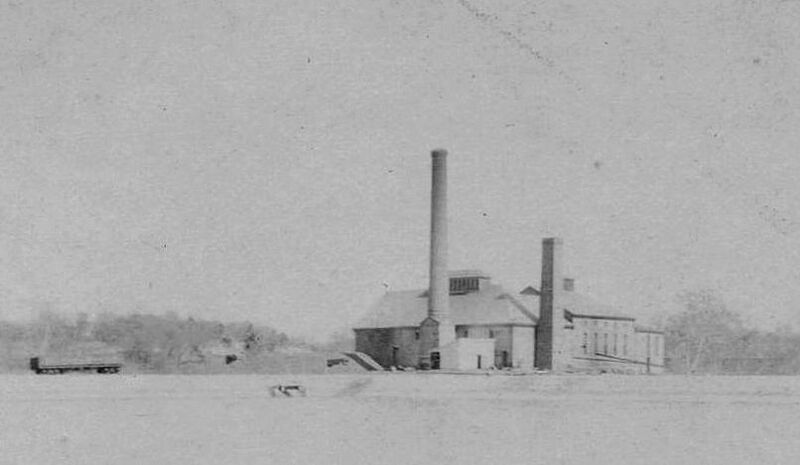 Original photograph of the three buildings is by Clifton Church and appeared in his wonderful book Dallas, Texas Through a Camera (Dallas, 1894). The photo of the ambulance in front of City Hospital is from the UT Southwestern Archives, with another photo of the same period here. A collection of newspaper articles on the hospital’s early history is here. An article on the City Hospital that pre-dated this one, with some harrowing descriptions of medical care in Dallas in 1875 is here. 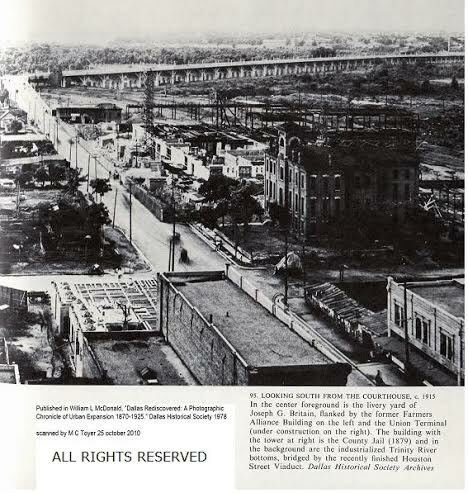 The flooded Turtle Creek pump station is from the Dallas Municipal Archives. Other photos of this station can be seen here. Bottom two photos of the Old County Jail sources are as captioned. For more photos on the Dallas Waterworks/Turtle Creek Pump Station/Water Filtration Plant, see a later post of mine, here. I tried your “Contact” link but it just sent me to the “About Me” page. I have better photos of the old County Jail if you are interested. I probably need to re-do that — my email is there, just buried a bit. I’d love to see better photos! My email is flashbackdallas214@gmail.com. Thanks!